I have a feeling you were brought here by the title of this post. In fact, the title of this post may have even warranted a scoff, or rolling of the eyes, or a little of both with some added lip fluppering. Skinny girls have it hard? What a load of baloney. Skinny girls get the guys and high paying careers and clothes. That’s what you might be thinking. But not me. I’m here to tell it to you from a different angle. I’m 5’1 (without heels) and about 100 pounds (without my purse on me). People—men and women alike—comment on my weight. I mention I eat too much junk food and am met with a offhanded reply. That’s okay, you’re skinny. Too much junk food is bad for anyone, skinny and not skinny alike. Skinny girls can’t talk about eating junk food. People hate you for it. Along those lines, here’s a list of other things skinny girls can’t do. Say the phrase, “I shouldn’t.” As in, smiling politely and saying, “oh no, thank you, but I shouldn’t have another slice of cake. . .” Any skinny girl will have learned by now that their limit of food intake is very, very different from the limit others have set on them. Enjoy playing with the icing on that second slice of cake, Skinny, because you’re getting it anyway. They cannot make weight jokes about themselves. Somehow this reflects off of the weight of everyone else in the room, and their audience is offended. Or else the audience thinks you’re on the brink of an eating disorder. They can’t find clothes that fit, and if they complain about it or even allude to complaining, somehow it’s misconstrued as bragging. When someone says, monotonely, poor thing, in every outfit you look like you’re wearing a sack of potatoes, that must be so hard for you. It’s not sympathy. It’s sarcasm. They can’t say they’re out of shape. Oh no. Suddenly they’re being interrupted by someone who insists on pointing out (finger gesturing and everything) their current figure size. Slim and in shape are very different things, but skinny girls are never allowed a word in edgewise to defend their case. Skinny girls basically cannot speak, and if it is about their waist size in any way, shape, or form, they are immediately interrupted and told ever-so-subtly to shut up and stop bragging. I don’t know when our figures became our fault, but this is reality. And yes, I will say it again, and this time you might just believe me when I tell you. . . 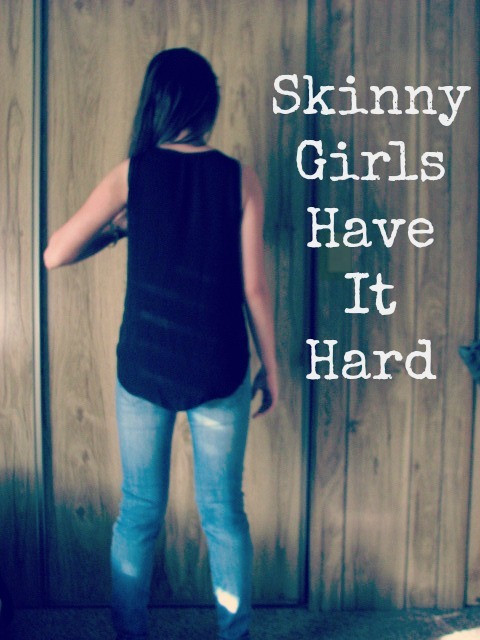 Skinny girls have it hard. Previous Post 2014 Favorites — Beauty, Tea, Books, People, and MORE! Oh yes, finally someone that gets it! This happens to me all the time, especially when I say I’m too full or shouldn’t have another piece of chocolate/other sweets. Every single time “Don’t worry about it, you’re skinny.” – That does not help! I have high triglycerides! LOL. I’ll be adding this post to my Saturday Link Love this weekend, it’s so awesome! Yes exactly. Skinny in no way reflects your fitness/health level. Just because it looks like you can take another piece of cake doesn’t mean you should! I’m so glad you understand! To be honest, I was kind of feeling that I was the only one who thought this way, I’m glad I’m not alone. Thank you so much for your comment! I’ve always wanted to gain weight but can’t. One time in elementary school, a girl called me anorexic so I replied in calling her fat. I only said it out of being hurt (…and dumb — I was maybe 10). Honestly, I would’ve rather traded bodies with her. She told the teacher and I was told that it’s a good thing to be called anorexic “BECAUSE IT MEANS SKINNY”. It’s sad that society is bringing up girls to believe that disorders should be normal. Nowadays, a lot of normal- and heavy-weighted girls are bashing skinny girls but like.. really, girls? What if we have health problems? Deficiencies? Certain genes? Hard times? No money? I hate talking about my weight haha, but I’m learning to accept being un-endowed — it’s whatever. Everyone just needs to stop being so body-negative about themselves and everyone around them because there’s really something beautiful in every person if they just let themselves be. Haha lmao, sorry for ranting. I totally understand what you’re talking about. I appreciate your rant! Everything you said NEEDS to be said. You’re right. It’s all about body negativity, and it just emanates from bitter or self-conscious people, making others bitter or self-conscious. Yeah, that’s another thing. You can be ‘skinny’ but still know you aren’t in shape physically. Others can’t tell you about your weight, because no one knows your body better than you do. I’m glad you liked the post. Thank you for your comment! as I got older and out of high school I realized that “skinny” was just who I was going to be. No matter how much junk food I ate (and trust me, I ate a lot) I never gained any pounds. I remember being at work and showing my co-workers (who worked in a different office in a different city) photos my wedding (i sent them through email.) they immediately called me. one was sweet and said I looked beautiful. one said “you need to eat a burger.” …omg, I was pissed. she was the “mean” one of the two and she laughed but I didn’t think it was funny AT ALL. so I replied “I do eat burgers. I had two last night.” and I actually did have two burgers last night for dinner, haha. why is ok to tell someone to gain weight but not okay to tell someone to lose weight? Lol it is true. “Gain weight” “lose weight” what’s the difference? They’re both pretty rude. I’m not sure when it became okay to comment on a girl’s lack of weight. And no worries about the long comment! They’re always welcome. I’m glad you understand! I wouldn’t say skinny girls had it hard, I’ve been many weights throughout my life and I can honestly say I’d much prefer the comments and to be thinner than to be bigger!